One or more photo(s) has been virtually staged. 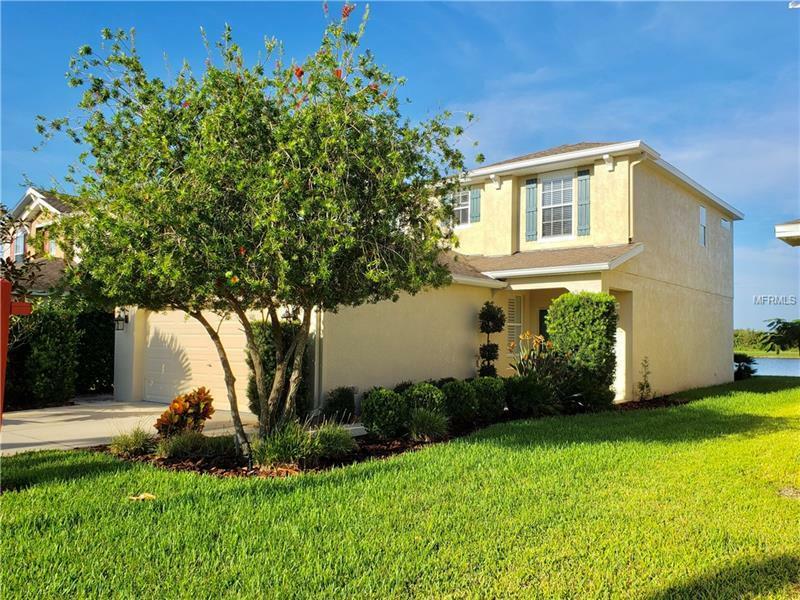 GORGEOUS WATER VIEW Home in the GATED Hawks Point community of Ruskin! Move-In-Ready with Tons of UPGRADES & TVs included! *New Appliances *Remodeled Shower *Water Softener *New Exterior Paint *Plantation Shutters *Crown Molding. Lovely Home features an Elegant Foyer to Greet your guests. Great Living Areas - Formal Dining Room (or DEN) features Hardwood Floors lets you Create Your Own Space in the front of the house! Spacious Family Room Open to the Kitchen and offers a VIEW PLUS a 60” TV and Boston Acoustics Surround Sound system. You will LOVE cooking and entertaining with the roomy Kitchen! NEW Stainless Appliances, New Sink and Disposal, Breakfast Bar, Wood Cabinets, Sunny Eating Area, and Slider to the Extended Screened Lanai. There is also a downstairs half bath for your guests. Upstairs you will find the Master Suite with a Large Bedroom, 2 Closets and Master Bath with Dual Sinks, Relaxing Garden Tub and Remodeled Walk-in Glass Shower. 2 more Generously sized Secondary Bedrooms and a Full Bath. Full Sized Laundry Room complete with Washer and Dryer and Plenty of storage space. Step outside to enjoy the WATER VIEW! The Extended SCREENED LANAI is a great spot to relax or entertain family and friends all year long! Outside Patio space is great spot for a fire pit. Hawks Point offers Gated access, a Resort-Style Pool, Fitness Center & Playgrounds. ALL with a Great Location - Easy access to major highways, schools, shopping, dining and entertainment. Be Sure Not To Miss This One!